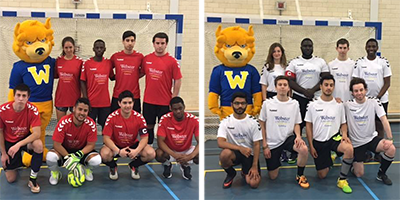 Each year the European campuses come together to play football (soccer, as Americans call it) and show off their talent during the Webster European Championship weekend, held in either Vienna, Leiden, or Geneva. The Leiden, Geneva, and Vienna campuses rotate campus locations to compete for recognition and this year the events took place on Dutch soil, Saturday, April 8, at the Leiden campus. 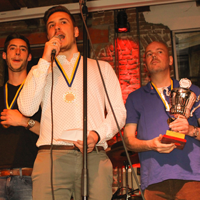 The weekend kicked off with the 14th annual international soccer tournament and Webster’s Got Talent show. Contestants on each of the three campuses held preliminary talent shows and sent the winners to the final championship event. Students Ellen Faye-Adams shared her slam poetry with the audience, and Daisey James-Weidner sang Demi Lovato’s, “Skyscraper." They both were selected to represent Vienna at the Webster’s Got Talent European Finals held in Leiden this year. Ellen Faye-Adams, representing Vienna, with first-place Webster's Got Talent trophy; other contestants brought skills to the stage. 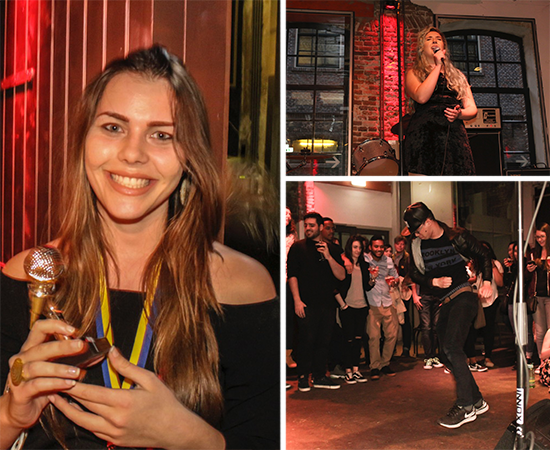 Saturday night after the tournament, students attended Webster’s Got Talent European Championship where Ellen Faye-Adams took home the gold. Other contestant’s talents consisted of singing, dance and stand-up comedy. The weekend was a success and a wonderful opportunity for Webster’s European campuses to come together and make connections. See more photos of the Webster European Championship weekend on Vienna's newsroom.